We are almost there. 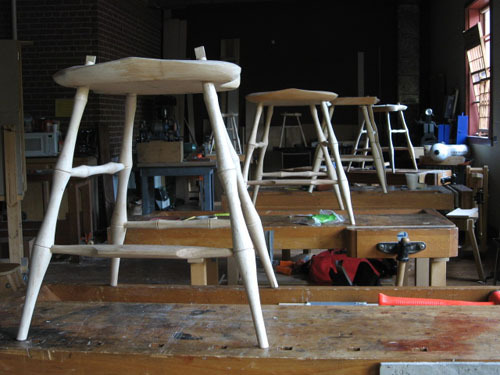 It is the end of Day Six at the Galbert Windsor Chair Class and today we legged ‘em up. All of us have been looking forward to this day all week. The way these chairs are made is with a “box” configuration in the stretchers and if you get an angle wrong or drill a hole wrong, then it will not fit into the bottom of the chair. I was a little worried once I put the four connected legs on the floor for the first time. The set was holding one leg up off the floor at a funny angle, kinda like a dog with a hurt foot. We rescued it and plugged it into the seat and it went right where it was supposed to fit. One thing that is striking is the stretchers are never test fitted into the legs. They fit so tightly that you will never get them out. They are driven home with substantial blows from a steel hammer and then a dead blow hammer from the other side and with a thin coating of hide glue; they are good for the next two hundred years. It really makes you want to do it right and then put your name on it. 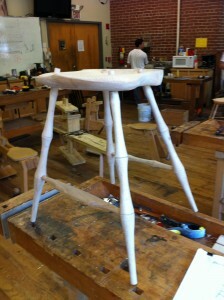 Another thing we did this morning was shape the front foot rest for our chairs. That is the first time this week that Peter turned us loose to do our own thing. It was great! You see we have not even been able to say the “r” word all week much less change the shape of our spindles from octagonal to “r” . Being able to shape that footrest however we wanted was terrifically liberating. Tomorrow we will add the back bow and spindles to finish our chairs and then go our separate ways. I am afraid it will be sad. Look how lonely the legged up seats looked after we all left today. 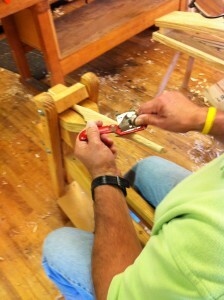 Click here to read about Day 7 of Peter Galbert’s Build a Windsor Chair class.